Between 1604 and 1606, Champlain was also responsible for exploring much of the New England coast, in a region then named Norumbega, claimed by both England and France. During this period, Champlain made three separate trips to the region in search of sites for settlement and a milder climate. 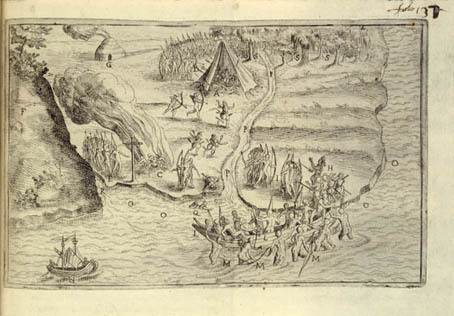 The first, in 1604, resulted in the establishment of positive relations with Aboriginal peoples in the area, as Champlain met with them, exchanged presents and worked to forge bonds of friendship and trust. The second and third expeditions, however, in 1605 and 1606, led by Sieur de Monts and Sieur de Poutrincourt respectively, were not nearly as successful in this regard. No invitations to participate in “tabagies” (celebrations) were extended and, in the end, mutual distrust and fear severed the bonds of friendship between the Aboriginal peoples and the visitors. This failure to establish lasting and positive relations with the region’s Aboriginal peoples effectively halted France’s colonization efforts south of the Penobscot River in New England. Champlain turned his attention back to the St. Lawrence Valley, where stronger bonds of trade and friendship persisted, for the time being.